The 54-year-old Singapore media veteran Woon Tai Ho developed a connection with art at an early age. While growing up as a kid in Geylang, he and his twin brother Daniel Yun – former CEO of Raintree Pictures and founder of recently closed film company Homerun Asia – used to hold magic lantern shows for the neighbourhood, charging 20 cents each. He sold his first painting when he was hardly 16. Later on, Tai Ho joined art clubs in TelokKurau Secondary School and HwaChong Junior College, which he attended on scholarships. When he was in secondary school, his father, a chef, passed away. His widowed mother raised her two sons and two daughters with great difficulty, including running a food stall. A bright student, Woon Tai Ho did well in life and rose up to become the CEO of MediaCorp News, Singapore’s regional news channel. 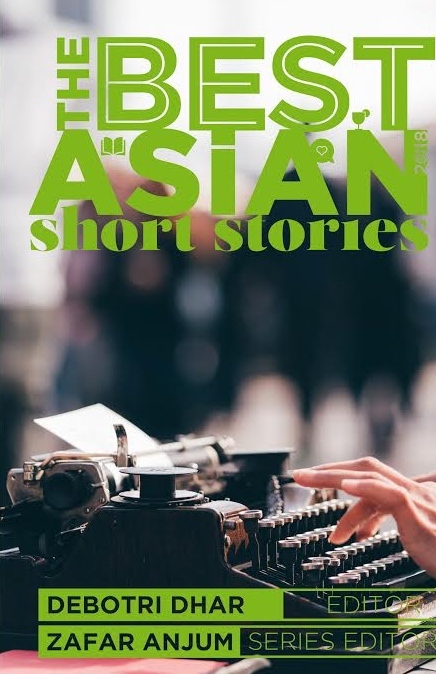 While still serving at MediaCorp, Tai Ho published his first book in 2008, To Paint A Smile—a non-fiction account of the life and work of Cultural Medallion recipient Tan Swie Hian. He left the news company in 2009 and started his own consultancy, Green Orange, to train executives and firms in media strategies. You can see paint and brush in everything that he touches. 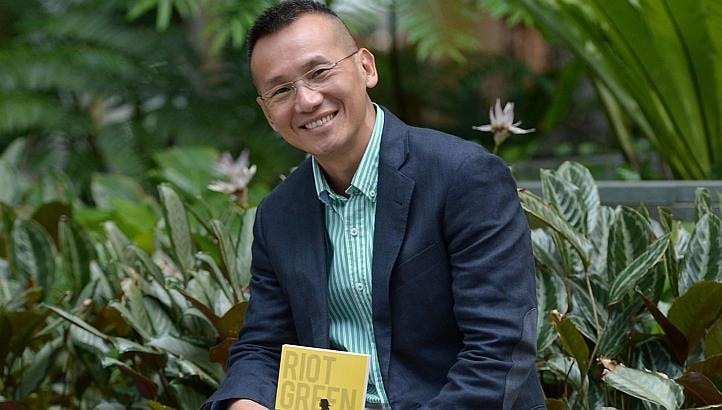 Almost five years later, Tai Ho is back with a new book, his first novel, Riot Green (Candid Creation Publishing, Singapore). To talk about his novel, Zafar Anjum recently interviewed him for Kitaab. The first time I met you was when you were reading from your first book, To Paint A Smile, at a literary gathering in Singapore. That was almost five years ago. Now, you have come out with your second book, Riot Green, which is your first work of fiction. What happened in between? Would it be right to assume that the novel took five years to write? Woon Tai Ho: I wrote To Paint A Smile as a challenge to myself. I wanted to know if I could actually write a book and I took close to a year. It was non-fiction and genre defying. It was simpler to write. Non-fiction relies on research whereas fiction is a piece of imagination and the irony is, fiction has to “make sense” for the reader. The idea of writing fiction was incubating in my mind long before I actually sat down to write it. Yes, I took almost five years to prepare myself for it but the actual writing took more than a year. 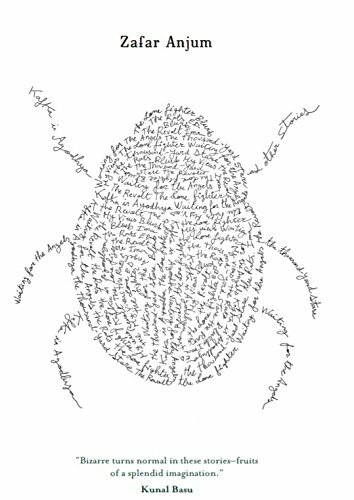 The protagonist of your novel is a young Singaporean artist, Melissa Soh. Your first book was also about an artist: Cultural Medallion recipient Tan Swie Hian. You yourself were an aspiring artist when you were younger. What can explain your fascination for the world of the artist? What draws you to this world of art? Did you want to say something or underline something about this particular world? I believe in setting fiction in a world I know reasonably well. This way, it is easier for me to make the characters real. I studied art all the way to Pre-University before I pursued Political Science and History in the University. When I started work, I also started collecting art. Work was work, but art was passion. When I left MediaCorp to start my own media consultancy, I also started as an art writer for dailies and magazines. I have just accepted the role of Director, Media & Marketing for all the three art museums in Singapore. So I can say my life has been immersed in art for most of my adult life. Why? Art moves me, and as a “player” in the art ecosystem, I want to be part of a force to move lives through art. Write about what you know. Do you believe in this dictum? Is it a cliché? No it is not a cliché. I think I have answered this question in the previous one. I set my fiction in a world I know, so the characters actually move against a real backdrop. I have seen artists paint, dealers negotiate, collectors maneuver. The characters were stitched together with my collective understanding of this world. So it served as a realistic canvas upon which I “paint” my novel. What is your notion of a writer? When did you start to think of yourself as a writer? 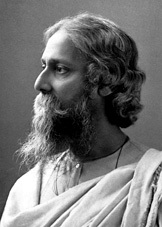 A writer uses the written word to express himself. The words are merely tools (of course he needs to use them well). In the end, like any creative person, a good writer has something useful or meaningful he wants to say from the well of his life experience. I thought of myself as a writer when I was in Holland studying broadcasting. One of the modules was “Scripting to Pictures” and I surprised myself. I did well, but more important, I felt lifted by the words I used. I realised then that my tools were my words, I can use them to access the inner most recesses of my being. Nobel laureate V S Naipaul once wrote that writing is like drawing pictures with words. What is your approach to writing? I am a visual writer because of my passion for the arts and my years as a director/producer of TV programmes. So I concur with him, my words are my paints. What triggers you to start a new writing project? Where do your stimuli for writing come from? A writer writes because he wants to express something in him he is experiencing. Five years ago, I in a happy place and the book was about one man’s happiness. It was my journey through an artist’s philosophy of happiness, my attempt at “painting” his smiles, hence To Paint A Smile. Five years on, I was at an emotional gridlock and I needed to disentangle myself. The main character Melissa needs to break from the emotional dependences and blockages (art dealers and collectors) and find her own voice as an artist. Green is not a primary colour but a mix of yellow and blue. It is a colour trapped between these two primary ones. So when yellow and blue overlap, you get green, and the more green the deeper the trap, hence riot green. The irony is, the ideal state is without green. Towards the end of the novel, Melissa realises she does not need green in her paintings. She can be bold and use just strong primary colours. The tale of Riot Green is a story of an artist’s liberation. A book is a good mirror of a writer’s emotional condition. What to you is the hardest part of being a writer? Is it the writing process? Is it what comes before it or after it? I enjoy the process; it is just my words and I – the quiet journey of creating. The hard part is showing your work to an editor and being told large chunks need to be moved or removed. It is tough when the logic of my narrative is questioned, when I need to explain and when I realise that a character or characters have been inconsistent. Agreeing to changes is good and humbling. The hardest part for a writer like me is acknowledging I am not a best selling author, and I have to to put the marketing hat on to sell the book. I have been lucky that the book has been well received but “touring” the book on social media, talking about it on TV, radio and print, and the countless book-signing – it can be unnerving. I have been putting a very person part of myself out there to be loved, and what if they don’t love me? So unlike the quiet creating part when it is just my words and I, marketing is the loud part, of interacting with the media, being in bookstores and explaining again and again why I have written the novel. What next? Have you thought of your next book? Riot Green was published in February 27 and in a month it went into second print. I am still “touring”. Yes I have another novel in my head but it may take another five years. 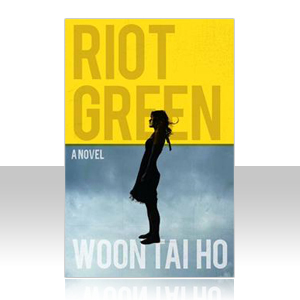 Riot Green is available in all major bookstores in Singapore at S$20. It is also available on Amazon.com (google Riot Green Kindle). Posted in Authors, Book, Features and tagged MediaCorp, Novel, Riot Green, Singapore, To Paint a Smile, Woon Tai Ho. Bookmark the permalink.